There are 23 Assisted Living Facilities in the Haines City area, with 3 in Haines City and 20 nearby. The average cost of assisted living in Haines City is $2,095 per month. This is lower than the national median of $3,346. To help you with your search, browse the 145 reviews below for assisted living facilities in Haines City. On average, consumers rate assisted living in Haines City 2.8 out of 5 stars. Better rated regions include Lake Alfred with an average rating of 3.0 out of 5 stars. Caring.com has helped thousands of families find high-quality senior care. To speak with one of our Family Advisors about assisted living options and costs in Haines City, call (855) 863-8283. Haines City, located in the Lakeland area, considers itself "The Heart of Florida" with a predominant 97 percent urban population and home to LEGOLAND Florida Resort. The city offers seniors an option between three assisted living facilities (ALFs) and 55 nearby ones. Each community is closely monitored and annually inspected by the Bureau of Health Facility Regulation. It also handles the approvals for any activities of daily living (ADLs), medication management and transportation options offered as well as necessary staff qualifications to ensure the health and safety of all seniors living in Florida. Haines City has a 6 percent lower cost of living compared to the national average. This lower cost is due mainly to lower real estate market prices that average 21 percent cheaper than the U.S. average. Temperatures in Haines City fall between 65 to 81 degrees Fahrenheit year-round. Average winter temperatures rarely drop below 51 degrees, while average summer temperatures rarely exceed 91 degrees. Seniors in the town have the option to participate in more outdoor recreations in the mild winters than those in other places around the nation. Alternatively, locals face heavy summer rainfall during peak months that deter outdoor adventures. The overall air quality in Haines city is around 27 percent better than that of other cities in the nation. Seniors may struggle with respiratory issues here since pollution levels frequently reach over 400 percent higher than the national average. Seniors in Haines City enjoy a lower violent and property crime rate and are considered 52 percent safer than those living in other cities in the state. Haines City has an array of community resources for seniors, including the Winter Haven Senior Adult Center, an organization that provides recreational programs and activities for those aged 50 and up at its local senior center. Haines City, part of Lakeland, is a member of the AARP Network of Age-Friendly Communities, meaning that its elected leadership "has made the commitment to actively work toward making their town, city or country a great place for people of all ages," according to AARP. Assisted Living costs in Haines City start around $2,095 per month on average, while the nationwide average cost of assisted living is $4,000 per month, according to the latest figures from Genworth’s Cost of Care Survey. It’s important to note that assisted living rates in Haines City and the surrounding suburbs can vary widely based on factors such as location, the level of care needed, apartment size and the types of amenities offered at each community. Seniors looking for financial aid can seek help from Medicaid through the Assistive Care Services (ACS) waiver. 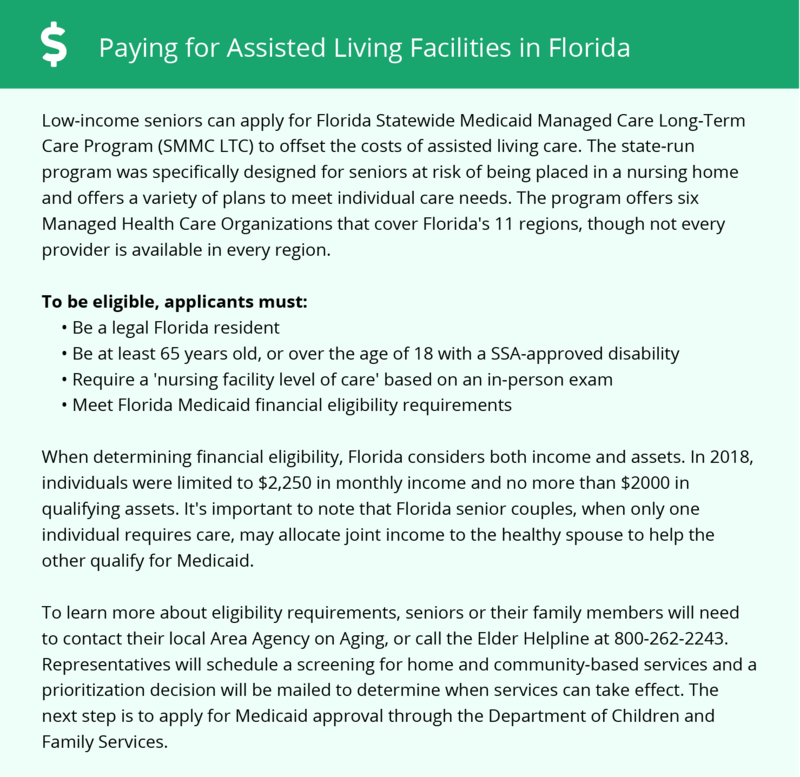 Haines City also offers three other state programs that include the Florida Medicaid, Managed Care Waiver Long-Term Care Program (MLTC), optional state supplement (OSS) and Supplemental Security Income (SSI). To see a list of free assisted living resources in Haines City, please visit our Assisted Living in Florida page. Haines City-area assisted living communities must adhere to the comprehensive set of state laws and regulations that all assisted living communities in Florida are required to follow. Visit our Assisted Living in Florida page for more information about these laws.